Gateway to the Mekong Delta, My Tho is the capital of Tien Giang province and an important market town – though for the popular floating markets, you’ll need to go on to Can Tho. In the 1680s, My Tho was founded by Chinese refugees fleeing Taiwan after the fall of the Southern Ming dynasty. The economy is based on tourism, fishing and the cultivation of rice, coconuts, bananas, mangoes, longans and citrus fruit. (60A Ð Nguyen Trung Truc; 9-11.30am & 1.30-5pm) Giant Buddha statues tower over the remarkable grounds of this quiet temple nearly 1km east of the city centre, where the monks maintain an ornate sanctuary, decorated with carved and gilded wood. They also give home for children with disabilities, orphans and other kids in need; donations are always welcome. To go here, head north on Le Loi, turn right onto Nguyen Trai and take the bridge across the river. After 400m take a left onto Nguyen Trung Truc. The entrance is approximately 200m from the turn-off, on the right-hand side of the building when you reach it from the ornate gate. (Cho My Tho; Ð Trung Trac) Spilling out onto the street facing Bao Dinh Channel, this market sells a typically Vietnamese array of dried fish, exotic fruits, doomed animals and strange smells. (85 Ð Ly Thuong Kiet; dawn-dusk) A great little temple with its all-seeing divine eye. (073-387 7883; www.tiengiangtourist.com; 33 Ð Thien Ho Duong; r 450,000-500,000d) Rooms at this becalming, clean and tidy hotel have hardwood floors, natty extras for example bathrobes and hair dryers, excellent bathrooms with free-standing claw-footed bathtubs and up-to-date furniture. (073-387 0875; 10 Ð 30 Thang 4; r 500,000-700,000d) This hotel has many rooms which all have a river view and come with the nice amenities at this great hotel. The restaurant here is worth a visit for its wide selection of dishes, plus there’s a great coffee shop. (073-387 2009; www.tiengiangtourist.com; 101 Ð Trung Trac; r 450,000-850,000d) This friendly, smart and well-looked-after hotel has decent-enough rooms with satellite TV and minibars. There are cheaper rooms without window and there are occasional traces of mould. My Tho is a province which is famous for unique vermicelli soup, known as hu tieu My Tho, which is richly garnished with fresh and dried seafood, pork, chicken, offal and fresh herbs. It is served either with broth or dry and can also be made vegetarian. Hu Tieu 44 (44 Ð Nam Ky Khoi Nghia; soups 20,000d), as vegetarians can indulge at Hu Tieu Chay 24 (24 Ð Nam Ky Khoi Nghia; mains 10,000-14,000d). (073-387 2742; 196 Ð Ap Bac; mains 45,000-150,000d; 8am-9pm) This friendly spot is down a lane off the main road into My Tho from HCMC, with tables set alongside ponds amid lots of greenery, and wonderful , beautifully presented seafood. (073-387 3756; 279 Ð Tet Mau Than; mains 35,000-80,000d) This small but extremely popular restaurant does a steady trade in tasty Chinese and Vietnamese fare (beef, chicken, pork, squid, crab, noodles, hotpots). There’s an English menu. (Ɖ 30 Thang 4; 5pm-late) Plonked right in front of the floating restaurant, this famous place packs in diners come evening, with a host of lively hotpot and fish stalls. (Ɖ 30 Thang 4; mains from 30,000d; 8am-9.30pm) By the Tourist Boat Station, this is a good choice for a breezy meal on the Mekong. (073-397 6459; 3 Ð Trung Trac; 6-11pm) It is located in a gorgeous old colonial-era trading house on the riverfront with lounge chairs and, upstairs, breezes and river views. Live music on Thursdays. There are new bridges and freeways which have remarkably shortened travel distances to My Tho. It takes you only nearly an hour to 90 minutes (traffic depending) from central HCMC (70km), as Ben Tre town is a mere 17km away via the new bridge. The My Tho bus station (Ben Xe Tien Giang, 42 Ð Ap Bac) is 3km west of the town centre on Ð Ap Bac, the main road to HCMC. Buses head to HCMC’s Mien Tay bus station (35,000d), Can Tho (50,000d), Cao Lanh (32,000d) and Ca Mau(123,000d). The Mekong River is one of the world’s great rivers and its delta is one of the world’s largest. It comes from high in the Tibetan Plateau, flowing 4500km through China, between Myanmar (Burma) and Laos, through Laos, along the Laos–Thailand border, and through Cambodia and Vietnam on its way to the South China Sea. At Phnom Penh (Cambodia), the Mekong River is divided into two major branches: the Hau Giang (Lower River, also known as the Bassac River), flowing via Chau Doc, Long Xuyenand Can Tho to the sea; and the Tien Giang (Upper River), which splits into a lot of branches at Vinh Long and empties into the sea at five points. 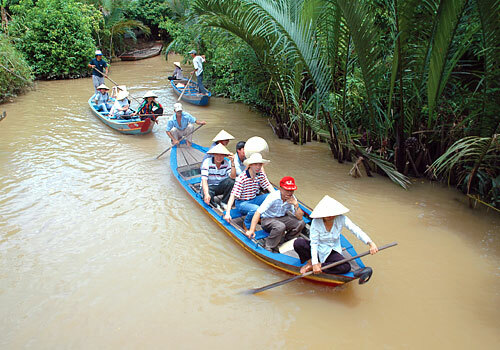 The large branches explain the Vietnamese name for the river: Song Cuu Long (River of Nine Dragons). The Mekong’s flow begins to rise approximately the end of May and reaches its peak in September. A tributary of the river which empties into the Mekong at Phnom Penh drains Cambodia’s Tonlé Sap Lake. As the Mekong is at flood stage, this tributary reverses its direction and flows into Tonlé Sap, acting as one of the biggest natural flood barriers all over the world. Unfortunately, deforestation in Cambodia is disturbing this delicate balancing act, causing more flooding in Vietnam’s portion of the Mekong River basin. In many recent years seasonal flooding has declared the lives of hundreds and forced tens of thousands of residents to evacuate from their houses. Floods result in millions of dollars’ worth of damage and have a catastrophic effect on regional rice and coffee crops. Living on a flood plain presents some technical challenges. Lacking any high ground to escape flooding, many delta residents construct their homes on bamboo stilts to avoid the increase in level of water. Many roads are submerged or turn to muck during floods; all-weather roads have to be constructed on raised embankments, however this is expensive. The traditional solution has been to build canals and travel by boat. There are thousands of canals in the Mekong Delta – keeping them properly dredged and navigable is a constant but essential chore. A further challenge is to help the canals clean. The usual practice of dumping all garbage and sewage directly into the waterways behind the houses that line them is to take its toll. Many of the more populated places in the Mekong Delta are showing signs of unpleasant waste build-up. The World Wildlife Fund (WWF) is working with local and provincial governments to protect the enviroment. In 2013, Laos declared its intention to build the 260-megawatt Don Sahong Dam on the Mekong, without consulting downstream neighbours, when its construction of the 1260-megawatt Xayaburi Dam continues in the north of the country. Dams on the Chinese stretch of the river have been thought to reduce water levels, and environmental groups have petitioned the Laos government to put plans on hold after concerns that the aim of 11 dams will disrupt the breeding cycles of a lot of species of fish. There are also fears that the reduced flows will cause more salt water to enter the Vietnamese section (a process exacerbated by global warming), which could have a catastrophic effect on production of rice.